Fun Eye Stuff | Visionary Eyecare's Blog: "The Eye Journal"
OK…now we’ve seen some interesting things here at Visionary Eyecare…but, this stuff really takes the cake! Eyeball Jewelry and Eyeball Tattoos….now we’ve seen everything! These cosmetic eye fashion procedures take the phrase “Beauty is in the Eye of the Beholder” to a completely new level…. 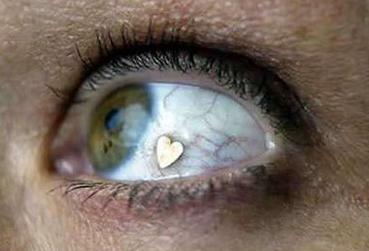 Apparently, there is a company called JewelEye that makes cosmetic 3.5mm eye jewelry platinum implants in the shape of a heart or a half moon. The implant is inserted beneath the conjunctiva (which is the “skin” that covers the white of the eye) yet, on top of the sclera (which is the “white” of the eye). Although Dutch eye surgeons at the Netherlands Institute for Innovative Ocular Surgery perform this 15 minute patented procedure (they say that they actually have a waiting list), in 2004 the American Academy of Ophthalmology (AAO) spoke out against this type of cosmetic implant. An AAO member stated that these implants may cause scar tissue or allow bacteria to get under the conjunctiva which could erode the sclera (the white of the eye) or cause other vision threatening infections. The AAO commented that if these problems ocured – then it could become very difficult to remove the implant. Another problem is that the conjunctiva is loosely attached to the sclera – so by placing an implant under the conjunctiva…in time, the implant may move around and not stay in place. This could irritate the patient’s eye and possibly cause vision problems. And another cosmetic eye procedure is the Eyeball Tattoo. Much like the JewelEye implant…the tattoo ink is inserted bewteen the sclera and the conjunctiva (the white of the eye and the skin that covers it) with a needle. This procedure looks like it is being done in a tattoo parlor – which is a not a sterile operating room. 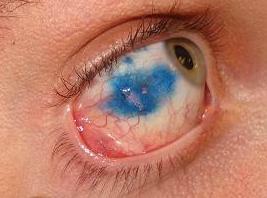 The risk of infection is very high – which can lead to visual impairment. Also, a needle being used that close to an eye in a surgically untrained hand can be very dangerous. One slip and the needle could scratch the front of the eye (the cornea). Worse yet, the needle could penetrate the eye – causing a retinal detachment which is vision threatening OR it could cause an infection inside the eye – which could lead to loss of the eye. WARNING – THE VIDEOS BELOW ARE VERY GRAPHIC!! Again, most eye doctors would advise NOT to have this procedure done – the multitude of RISKS FAR OUTWEIGH any positive cosmetic benefit. Time.com (in partnership with CNN) recently reported that a prototype of a “bionic” contact lens has been created and Time has listed this as one of the Best Inventions of 2008. The University of Washington’s Babak Parviz has created a prototype “bionic” contact lens that creates a display over the wearer’s visual field, so images, maps, data, etc., appear to float in midair. The lens works using tiny LEDs, which are powered by solar cells, and a radio-frequency receiver. We think this is really “kewl”. Maybe one day during your eye exam you can ask one of the Visionary Eyecare Doctors to be fitted for a contact lens that would allow you to see a map while you are driving or see an excel data sheet floating in mid air (that only you can see) during a really important presentation. Wow! Now that is definitely a huge step up from just plain old colored contact lenses or bifocal contact lenses….this is the next evolution BEYOND just seeing 20/20. Check out the video below to see more of TIME’s Best Inventions of 2008 – including futuristic swimwear worn by Michael Phelps, DNA test kits, a very sporty and fast electric car and lots of different kinds of robots…. How can instantly improved vision NOT be at the top of your To-DoList?!?!? Do You Like Number One or Number Two…..??? From Dr Dawn Bearden and the entire Visionary Eyecare team (in Pembroke Pines and Sunrise) to you…….ENJOY!! 1. Icefire, 2. Wildfire, 3. Zoomin’, 4. Jaguar, 5. Zebra, 6. Cat Eye, 7. Knockout, 8. Black-out, 9. Red Hot, 10. White-out, and 11. Hypnotica. Its time to start thinking about enhancing your Halloween costume and Wild Eyes Contact Lenses are the perfect finishing touch to any spectacular costume! 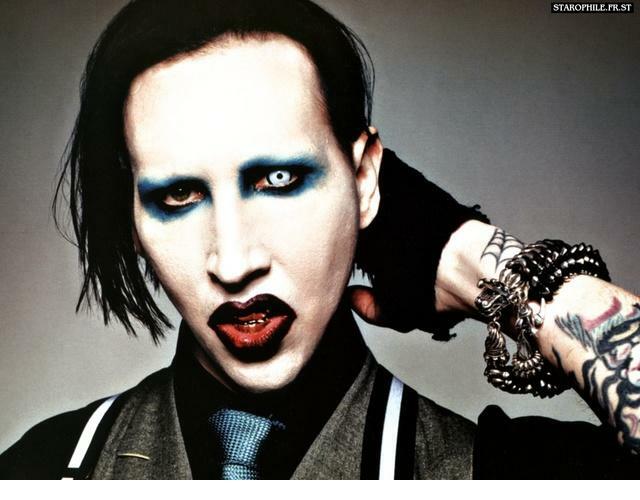 The most popular Wild Eyes color contacts around Halloween are the Cat Eye contact lenses and White-Out contact lenses (made popular by Marilyn Manson…a Florida native). Costume contact lenses are stylish to wear and they are designed for fun but remember, that they are still medical devices that will be placed onto your eyes. They must fit you properly and be well taken care of to keep them very clean so you don’t get any eye infections. Contact lenses that do not fit properly or are not cleaned can cause very serious eye problems. 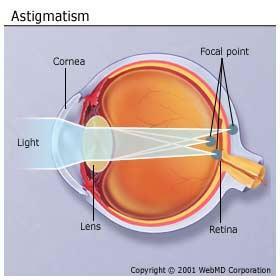 So, it is important to remember that you need your eye doctor to accurately fit them on your eyes and give you a prescription for them. Even if you don’t currently need wear glasses or contacts to see clearly – you still need a prescription for them to ensure they FIT your eyes properly. Have lots of fun with your costume contact lenses but, NEVER SHARE OR SWAP these or any type of contact lenses with anyone else – this can lead to pinkeye and other potential serious eye infections that could lead to blindness! Never buy your costume contact lenses from a place (like a Flea Market) that does not ask you for a valid prescription from your eye doctor. 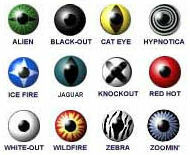 Some of these lenses sold in these places are not FDA approved. You ALWAYS need a prescription from your eye doctor to ensure that the contact lenses fit you properly, feel comfortable and won’t cause you any serious eye problems.